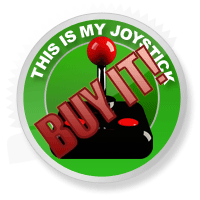 Puppeteer Review - This Is My Joystick! Pantomime season is nearly upon us yet again. Christmas just around the corner. The theatre beckons us like a Mecca for those wanting to find comfort in familiar stories, rekindling the joy and hope of childhood. With Puppeteer, the romance of the theatre is beautifully realised for us all to experience, without even leaving the comfort of our own home. Why do I so brazenly mention Christmas? Well, it’s a time when many of us head to theatres and schools to witness pantomime and nativity plays. If you think about the zaniest story you’ve seen in the theatre and then double it, triple that and then quadruple that, you might then have an idea of how crazy the story is in Puppeteer. With fast shifting beautiful scenery, fantastical story and gorgeously created characters, I found myself being drawn deeper into the universe of Puppeteer as each scene sprung its way into view, telling the tale in a seemingly effortless way. To overthrow an evil tyrant, our hero Kutaro, a headless puppet boy, has to find a magic pair of scissors. Can it get any crazier than that? Yes, yes it can. The self-declared Moon Bear King is the wretched evil in this story. A nasty piece of work if ever there was one, that proves his odious intent, by spiriting away children and stealing their souls to increase his already vast magical powers. Kutaro is a young boy, kidnapped by the Moon Bear King and turned into a puppet. The Moon Bear King asks Kurato if he’ll be his friend, forever. Kurato nods but in a rage the Moon Bear King pronounces Kutaro a liar, pulls off his head and swallows it. Castaway, Kurato is assisted by Ying-Yang, a cat fairy, who introduces him to Ezra the Moon Witch. She provides Kutaro with an initial replacement head and empowers him with a task to retrieve a powerful weapon known as Calibrus, a pair of scissors. She leads him onward towards his goal of confronting the Moon Bear King and retrieving his proper head. The mission sees Kutaro on the trail of the Moon Bear King. He’s helped on the way by numerous other characters and hindered by the Moon Bear King’s generals, who lay in wait to stop Kutaro from succeeding in his quest. At first I felt reminded of LittleBigPlanet, but with an overarching story and characters that ooze with personality. Even the headless, voiceless Kurato tugged at my heartstrings and I found plenty of instances that made me smile and laugh. It is with this level of dexterity and devotion to the characters and its story that the play really comes to life. Much of Kutaro’s charm comes in the form of expert animation and the fascinating things he gets up to as you heave him around the stage. His heads are a key gameplay mechanic; some head changes are vital to your progression, others seem to be there for humour or to strum at your emotions. Each head is unique and with at least one hundred different ones to find and collect, each head keeps the progression of the levels fresh. Level structure is based over seven different acts that take place in different areas, giving Puppeteer a real sense of journey and adventure. 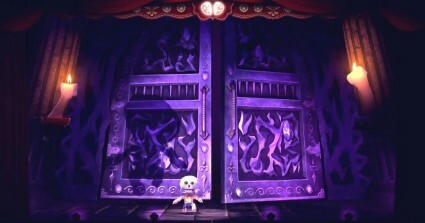 Within each act, there are three curtains, each containing hidden bonus levels that can visited by activating the unique animation of specific heads. 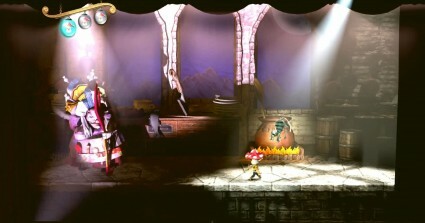 The usual platformer will see us collecting gems or crystals, and here Puppeteer is no different. By collecting one hundred moon crystals, you receive another chance to continue and avoid restarting a level from the beginning. I found the collection of these to be quite easy and before long I had on average twenty to thirty continues available to me at any one time. These precious continues are needed if Kutaro should be unfortunate enough to become separated from all three of his allotted heads. I had many agonising and fleeting seconds trying to recover Kurato’s decapitated head to avoid having to continue. Conversely, I spent many agonising moments using a continue. One significant and crucial item in your arsenal is a pair of magic scissors. Yes, I said scissors. Perhaps the oddest weapon to take on the forces of evil with, these scissors are so special they even have a name; Calibrus is a truly powerful weapon, able to cut through most things, as long as they are card or cloth and a lot of other things besides. Speeding up the snip using the square button reminded me at times of protracted International Track & Field sessions with my mates. My hand hurt with the ferocity in which I took action against the foes and scenery laid in front of me. A rather sinister element of Puppeteer is the liberation of children’s souls. Each Earth child takes on a nightmarish, but funny-looking, monster persona. Once struck down or blown up, these release a balloon containing the soul. While this harvesting souls sounds all a bit Bioshock-Little-Sister-ish, I should add you are rescuing them from the Moon Bear King. Other than a count at the end of the level and a running tally that adds up over the course of the story, I didn’t really see any point to them, other than a means in which to give another vehicle to the already bursting story. The real magic of the game is that each head you find has its own special animation that can be set off by pushing down on the D-pad. Each unique gifted frame is a delight of cute, happy dances that beg you to fall in love with him. Behind the third curtain of every act awaits one of the Moon Bear King’s powerful Generals. I’ve always sucked at boss battles. Even though these each require some grey matter to get through, however, they are not impossible. A little experimentation and practice will result in the demise of each larger-than-life minion of evil. These sections invariably materialise into frantic rushing and jumping to avoid being stomped on or blown up. 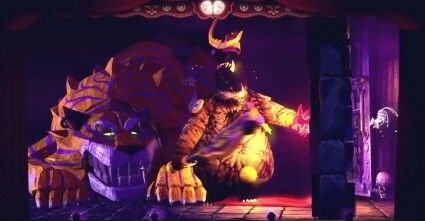 While desperately scuttling about the stage, Kutaro is presented with visual hints that relate to a skill he has learned on his adventure thus far. Sometimes if you’re slow to see a hint, your companion fairy Pikarina will shout it out, trying to help you. All the while, the narrator announces Kutaro’s advances and recoiling actions, just so you don’t miss any little details along the way. A small element of these boss battles introduces quick-time events; while I didn’t really like these as much, it does give Puppeteer a larger sense of scale bestowed upon you. Pikarina and Ying-Yang can be controlled at the same time as Kurato. With a little practice, you can move these fairy wonders around to interact with the objects in the scene. This lets Kurato benefit from unearthed crystals, cauldrons containing heads, hints and a plethora of amusing ways to interfere with the background. Puppeteer is a wonder to behold, with its painted papier mache mechanical sets and puppets of varying size and complexity. It’s crisp and vibrant in so many ways and a complete credit to the scores of artists that worked on it. The sets, that’s what they are, submerge you into the environment as it unfolds before you, in a theatre, a member of the audience. Animations are smooth running and amusing with it. Multi-layered backgrounds enhance the depth of field, helping to impose the sensation of millions of moving parts that keep the theatre ticking. All the while a spotlight keeps Kutaro pinpointed on stage, following him around wherever he may go. Lighting and the use of darkness balance the bright colours and add undertones that keep the feeling oh-so-slightly ominous. There isn’t a lot of media that is enhanced by the addition of 3D. While not essential by any means, the third dimension is given a stable platform in which to dazzle you with. If you let it, Puppeteer will embed you in the audience and allow you to experience the quick set changes of unfolding scenery as if you could almost touch it. I’m still not a huge believer of 3D; however, I have to say that given the stationary nature of the stage, it helped in a little way to engage me deeper into the story and increase believability that one could be watching this all on a real stage or live puppet show. There are so many neat features in the sound department of Puppeteer that you would be forgiven for thinking you were actually in a theatre. As the curtains open, people hush and if you stay still the audience begin talking to each other in a rising crescendo of voices. The voice acting is phenomenally potent, with every actor and actress giving perfectly quirky and entrancing performances. Stephen Greif, a veteran of the stage and screen, is the disembodied voice of the theatre and narrator of this peculiar yarn. A deft and talented speaker if ever there was one, a voice you can just listen to and forget what it was you needed to do. Even Richard Ridings, a voice-over legend famous for many TV shows, films and games (useless trivia: he’s also Daddy Pig from Peppa Pig) makes a notable performance here. Patrick Doyle lovingly fills the theatre with music that befits the situational circumstance and running tale that Kurato find himself in. Patrick is perhaps unknown by the masses via his name alone. His talented and multi-award-winning contributions include music for many a television programme and film soundtracks. Here, he has weaved a sometimes delicate and other times brash audio delicacy that would feel believable in any live theatre, being coupled with the crazy story of Puppeteer. 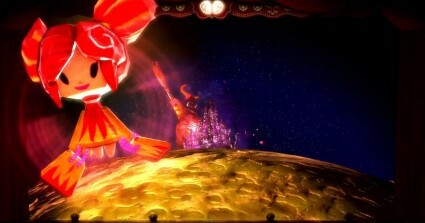 From the face of it and as pretty as it is, Puppeteer is just another platformer. Much like other platformers you will have played, you run, jump, swing and bounce your way across from one side of the screen to the other. I’ve done it countless times before, in the likes of Mario or Sonic. However, there is something quite charming and enchanting about Kurato, that makes him much more interesting than either that Italian plumber or that speed-obsessed potential road-kill. Once in a while a game will consume you and everything you do, making you want to play it whenever you get chance to. I found this with Puppeteer; the feeling was very much that I wanted to experience its darkly-told theatrical masterpiece, all the time. It was with both delight and relish that I played Puppeteer. I can’t think of another platformer that really combined an enjoyable vibrant and romping story, gameplay, sound and imagery together in one package, tied quite so neatly. It has very few annoyances and is near perfect in every department, trumping the other kings of platform along the way. I wondered whether the tale was a little dark for children to play at first, but then I considered nursery rhymes and classic tales like Hansel and Gretel and Little Red Riding Hood. These tales were dark and mean in places, but kids love hearing them. Puppeteer manages to invent a new, but familiar tale, that you want to be taken on a ride by. Clever writing and direction plays a large part to Puppeteer’s success. If you’ve been sitting on the fence about buying this or thought it looks too much like LittleBigPlanet, just do yourself a favour and buy it. It’s a little package of happiness, just bursting to say I love you from start to finish. I loved every minute of Puppeteer and it clearly deserves as much applause, shouting, whistling and praise as I can give it. Bravo! Encore!